My little Hooligans were pretty much doing the "Porch Sittin"
and that was pretty much the extent of my exercise for the day. The walk from the back to the front! LOL! I've had an awfully hectic couple of weeks here leading up to this weekend so I was ready for some peace and quiet and didn't feel the least bit guilty about the lack of exercise. 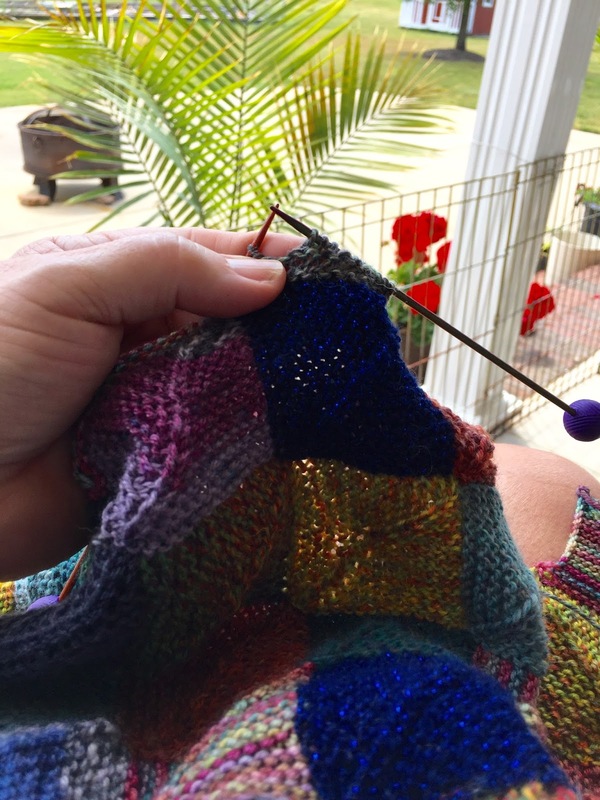 Sunday was another beautiful day of more "Porch Knittin" but I also did a bit of "Podcast Watchin". I came across a rather interesting one called Fruity Knitting Podcast. The link is here https://www.youtube.com/watch?v=Zv34-_vn-jE . It's a relatively new podcast and the first episode was done in the most quaint cozy little window seat with Andrea and her husband (who also knits....how fun is that!!) along with their daughter and french poodle just chatting about various knitting projects they've finished. I was immediately sucked in and settled into my window seat with some knitting of my own . They were a very cute couple with a knack for simply sitting and chatting about knitting. It was very calming and extremely interesting. I learned that another word for sweater is jumper. Lilly Bean seemed to be enjoying their calm conversation too. wearing bight orange feathers and I had to pause the podcast to remove her from the top of the window ledge!! So aside from that little incident, Sunday turned out to be every bit as relaxing as Saturday and I am now following the Fruity Knitting Podcast and looking forward to the tutorials Andrea is promising! Thank you all for the good thoughts and wishes for BG's fast recovery. All those positive thoughts for him are paying off so far. Things are progressing well. The swelling is going down and the stitches are holding with no signs of infection so far and no signs of those awful dogs either. He had stall rest today as it was raining all day and we didn't want those stitches to get wet. He'll be getting another shot of antibiotics on Thursday and a check up by his Vet. I kept having flash backs of the whole ordeal so I was looking for a good distraction to take my mind to a better place. I found this......http://www.knitpicks.com/patterns/Maritime_Facecloth__D55807220.htmllink for a really cool wash cloth pattern that is very similar to my favorite dish cloth pattern. The difference is this one has a cable knit around the outer edge. Which is really nice because the cable helps to keep the square shape when the cloth is wet. My dish cloths always get a bit stretched out of whack when they are wet. This one holds it's own and it's a bit bigger too, which is nice. This took my mind right off that whole horrible ordeal for a whole evening! Thank God for knitting! Lol. all of a sudden another popped up! As fun as they are to watch, I can't have that going on in the plants.......how would I water them?! I'm going to have to put the Not for Rent sign out! how ever moments after I took this shot of my perfect creation all "you know what" broke loose!!! I looked up and saw wild dogs attacking my horse in the pasture!!!! I grabbed a spray bottle of water (in hindsight I prolly could have thought of a better weapon but hey...I was panicked) and shot out the door with Levi right on my heels and the door slammed behind us and LOCKED!!!!!! So now I'm home alone with no phone (it's on the kitchen counter next to that perfect loaf of bread), no key (that's on my key ring in the car with the Gardener at the gymnastics meet an hour away) and Levi (who's prone to seizures if he gets the least bit excited) locked out there with me and wild dogs having at my horse. At one point we were all duking it out in the barn and in my horses stall! This is the stuff nightmares are made of!!! I managed to get the wild dogs out and the big doors shut but was then stuck in the barn with an injured horse, no phone, and wild dogs outside the doors waiting for me to come out! Once they Left I needed to get to a phone fast for help! I ran (and I'm not a runner) as fast as I could across the road to the only neighbor that was home ( a 70 year old sweet southern lady who had a stroke a year ago and is partially paralyzed) and we started making calls! Of course it's the weekend so the calls were getting us no where because no one works on the week end! No animal control.......no locksmith and the very first vet I called from her phone book was not available on week ends......we had to pick the lock to get the door open again so I could get the number of my equine vet off the refrigerator magnet( this will be moved to the tack room asap) and put the call in for help. They came immediately and the rest of the day and evening was spent stitching up all my poor, poor BG's wounds. He's sedated now, on pain meds and antibiotics and we have a lot of doctoring ahead of us. Oh.....and that perfect bread is going over to that sweet southern neighbor and her lovely Grand daughter first thing in the morning. Thank goodness they were there to help us out. Animal control will be hearing from me on Monday......I'm worried those horrible dogs will come back! Everything in my life has pretty much been on hold lately because I'm basically being held hostage by a certain sock yarn blanket. I'm starting the fourth row of it and me thinks it's starting to register that this may take a while to finish. 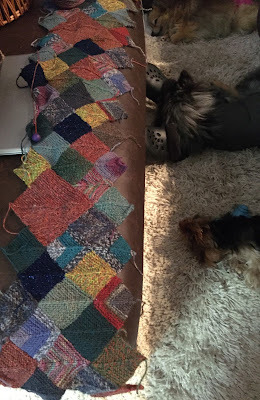 My poncho is half done and waiting patiently for my attention. I have a pair of socks with just the toes done tossed in a to do basket and a bunch crispy little critters in dire need of baths and hair cuts so I had to tear myself away from the mitered squares for an all hands on deck spa day. This is not the look of a happy Yorkie! Lilly Bean on the other hand is quite pleased and all perched and ready to watch the whole process. She loves terrorizing the dogs so this is right up her alley. I have to move through this process rather quickly cuz it can get pretty ugly in a hurry. That's three and half pounds of slippery when wet very pissed off ready to leap out of the sink canine right there! Wait till he finds out he's getting his nails clipped too........he totally loses his patience with me during that whole process! :-0 I'll be lucky if I still have all my fingers left for spinning that rose gray alpaca this evening.